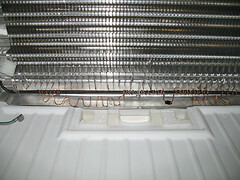 The condensate drains in certain models of this refrigerator repeatedly freeze over, causing water to run inside the refrigerator during defrost. If you manually clear the ice and open the drain– which you shouldn’t ever have to do– the problem will just re-appear… unless you apply the Fixite Do kata that ol’ Samurai’s about to ‘splain to ya. Here’s the inside scoop: As the compressor runs, humidity in the air inside the freezer condenses onto the surface of the evaporator. This frozen water on the evaporator is called condensate. The condensate will continue to build up on the evaporator over time, forming a white, fuzzy layer that periodically needs to be melted off during the automatic defrost cycle. 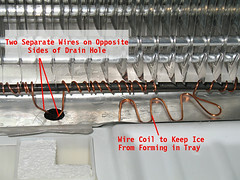 During defrost, the compressor is turned off and a heater under the evaporator is fired up to melt the condensate off. As the condensate melts, it drips into the pan beneath the evaporator. Problem is that, in this particular design fluke, the defrost cycle ends and the compressor starts running again before all the water drains from the pan and, as a result, some of the water gets frozen. Next cycle, a little more gets frozen, and so on until the drain is blocked and the melted water starts backing up during defrost and running into the beer compartment below. What’s the heater beneath the evaporator called? Did you answer, “I dunno and I don’t care, just get on with the friggin’ article?” Well, I’m sorry, but that’s not the right answer. The correct answer is “defrost heater.” Thank you, come again! OK, enough high-level refrigerator quantum theory. Let’s get on with the fun stuff: The Fix! You can click the pics below for the larger view. 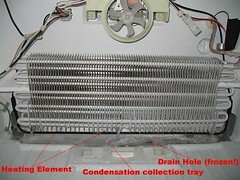 Here you can see Le Probleme and get the layout of the essential freezer anatomy for this repair. 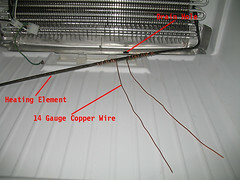 12 ga. solid core wire is preferred because it’s slightly bigger and conducts heat more efficiently; but 14 ga., as shown here, is OK.
Make the drain heater by wrapping one end of the wire around the heater a few turns, as shown here. The other ends will be fanned out in the drip pan and run into the condensate drain hole two or three inches. Just watch out for the sharp fins on that evaporator; they’ll shred your hands like ground beef before you even knew what happened. OK, it’s not really that bad; I just wanted to talk like a crusty old timer. Would it kill you to humor an old man? Muy domos to Senior Apprentice Appliantologist TMR777 for the beautifully annotated photos of his fine craftsmanship. This entry was posted in Refrigerator Repair on May 26, 2009 by Samurai Appliance Repair Man. Thank you for this post. I’m hoping this will solve the annoying problem I’ve been having with water pooling at the bottom of the fridge. I would be willing to give some money for these instructions if water no longer appears in the fridge. This is incredible. I was just about to use this fix on my own when I found this. Thanks for validating my thoughts. Thank You so much worked like a dream!!!!!!!! Thank you so much for sharing your wisdom sensei. I almost paid another website for a “possible” solution, then, I was guided to you. Domo arigato.